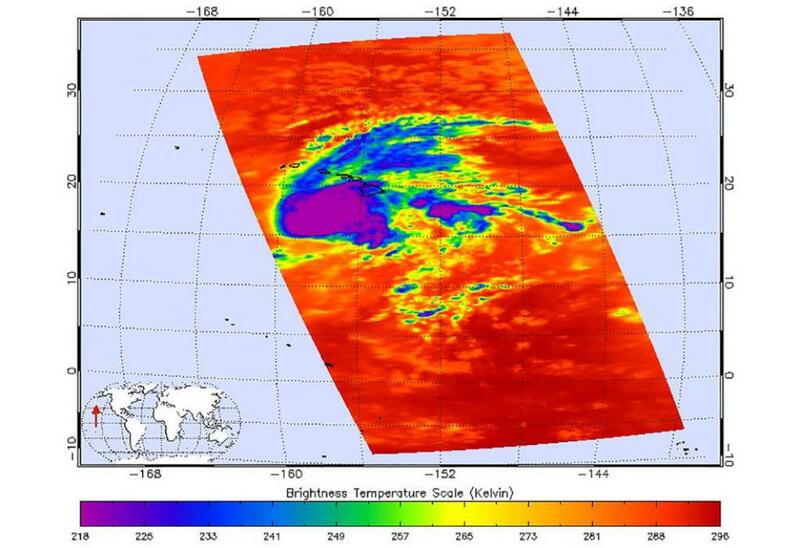 (This image shows Hurricane Lane as observed by the Atmospheric Infrared Sounder (AIRS) instrument on NASA's Aqua satellite on Thursday, August 23. The US State of Hawaii has heaved a sigh of relief after Hurricane Lane, which had been threatening it last week, moved away from the archipelago. The hurricane Lane, which last week blew 150-mph winds, dissipated and was downgraded to a tropical storm Friday evening as it began heading away from the islands. But it brought record rainfall to Hawaii’s Big Island and caused flooding, landslides, road closures and power outages. Three feet of rain fell at Big Island’s Hilo Airport. More than 4 feet of rain fell on other parts of the island. No deaths have been reported due to the storm. The administration has also not released any fifures of how much damage has been caused. The residents of the archipelago spent Sunday cleaning up the mess that the storm left.